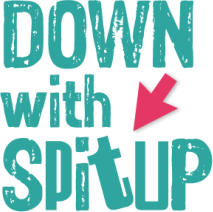 ​The Down With Spit Up™​ Bib Builder was created because it had to be. When I realized my newborn’s massive reflux was more than a laundry problem, I needed durable, absorbent, (and multiple) bibs and burp cloths to manage the volume and frequency of spit up during feedings. No store brand measured up and plastic bibs were no help. He would need a bib for frequent messes on his clothes and ours, which compounded our actual laundry problem. We would use multiple bibs at feeding times, along with multiple burp cloths on hand at all times. From reflux issues and burping, to our eventual transition to solids, I needed a simpler way to manage the messes - and stresses - while focusing my attention where it was needed: on my child. More than half of infants suffer from reflux, with many tagged as “happy spitters.” I designed, constructed and used Bib Builder for 18 months, and now ready to share this useful product with other families and caregivers around the world. Bib Builder comes in two sizes and textures: HEAVY, cotton terrycloth, and LIGHT, birds-eye cotton. SAFETY FIRST: Bib builder is designed for use for feedings only, and under the direct supervision of an adult and caregiver. DO NOT use bib or any related product on child while unattended or sleeping due to suffocation and other safety risks. Follow the direction of your doctor for all safety related questions and safe sleep tips. ​These products are handmade and available on the Etsy Shop: https://www.etsy.com/shop/DownWithSpitUp. From the base bib to the top bib replacements as they are soiled, and the bottom burper attachment, Bib Builder™ is the one solution you need for reflux, drool and all your baby messes. Bib Builder™​ elements are designed for quick wash, dry, and repeat, removing the need for the piles of bibs and burpers around the house. It's also good for transition to solids and self feeding. Crafted of 100% cotton, absorbent towel-like material, the bibs are soft to the touch and able to handle the largest volumes of spit up, protecting people, clothes and more. Bib Builder™ is available exclusively through Etsy or special order at this time. Contact Christina@downwithspitup.com for info, options and pricing. Bib Builder™ and Down With Spit Up™ 2019. All Rights Reserved. Patent Pending.